In the far future, the United States and an alliance of interstellar colonies are at war with the United Nations. The centerpiece of this disagreement is that the UN fervently believes that technology will eventually lead to the utter destruction of mankind, and the only way to save humanity is to put the kibosh on any future research and development. The US believes that freedom – in this case, the quirky freedom to develop new widgets – is worth fighting a bitter and violent war over. As Mission Critical begins, your ship is on a secret, ahem, “critical mission” in orbit around a distant, unknown planet. Not distant enough for the UN, it seems, since they are waiting in ambush on the other side. This, of course, begs the million dollar question: If the UN is basically composed of a bunch of Luddites, what in the HELL are they doing in space? Hypocrites! But I’m getting ahead of myself. Mission Critical is a Myst-style adventure from Legend Entertainment. You play as a newly-assigned supply officer on the starship USS Lexington. You’re escorting a science vessel on the aforementioned super-secret mission, when your ship gets attacked by the UN. Everything that happens next is covered in the lengthy opening cinematic, so I’ll gloss over it. After a crushing defeat, the Lexington’s captain (played admirably by an underused Michael Dorn) surrenders and orders everyone to transfer to the UN battleship. Well almost everyone, as he makes sure to klonk you on the noggin and leave you behind. Good thing for you, as his next move is to detonate a nuke as he and his crew land on the UN boat. So now absolutely everyone is dead, except you, and you must use video messages and clues left behind to keep the ship together long enough to complete the mission – oh, and also try to find out what that mission is. 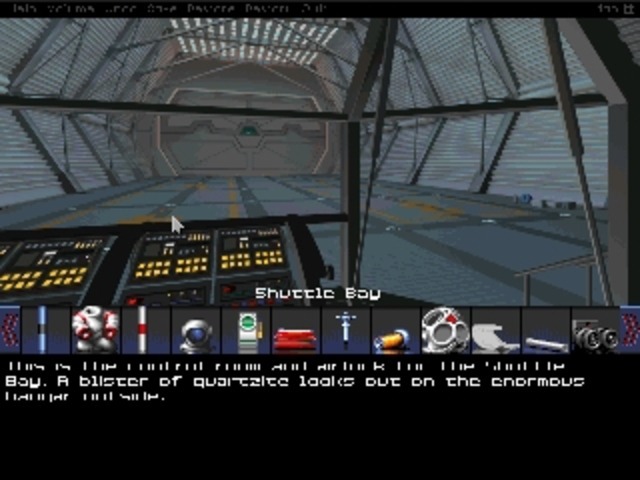 Mission Critical is the only adventure game I’m aware of that centers its adventuring almost exclusively on operating and repairing a starship. From the very beginning, you must move around its nine decks to patch holes in the hull, get coolant to the reactor before it melts, and bring the ship’s various systems back online. Cutting torches, multitools, and gieger counters will be your pick-up items. Twisted wreckage, blown circuit chips, and stubborn computers will be your puzzles. Once you shore up your ship’s ailing systems, you’ll interface with various software and ship stations in your quest for answers, as well as discover some explosive intrigue previously stirring amongst your late crew. And though I will not give away the mission, or where it shall all lead, you can be assured that the third disc contains wild, speculative science-fiction allegories that would make D.C. Fontana proud. If any of this interests you, you’re about THIS close to having a great time. Why the caveat? Well, Mission Critical will be one of, if not the, easiest adventure games you’ll ever play. I shouldn’t be surprised. All the warnings were there. The manual devotes a scant half-page to actually playing the game (paraphrased, “It’s really easy, just point and click!”), and the remaining 25 on how to make a DOS book disk, or how to link up with Legend tech support on CompuServe. There is an in-game help system with an online tutorial – the first chapter: “What is an adventure game?” I’m not kidding. The rest of the tutorial is an animated sequence as the game takes control of the mouse and shows you how to click on items in the world and your inventory. Again, for confirmation, the game teaches you how to click. Uh-oh. To its credit, the tutoring is optional, and mostly ends there. So if Legend really was trying to bring newcomers into the genre, then I guess I shouldn’t be too hard on them. However, the game itself still seems to be geared toward “the kind of people who don’t usually play adventure games.” It’s easy all around, and very forgiving. There’s a tremendous sense of urgency constantly being generated by the plot (when I hear a description of how the reactor will turn to radioactive slag and eat through the hull, I start running), but the time limits for completing these 15 minute mini-quests number in the hours. You’ll feel rushed, up until the point that you realize you aren’t rushed at all. Puzzles are surprisingly easy to solve, and require rarely more than one item, taken from an obvious place for that item to be. I did not require a walkthrough at any time, mostly because the solutions are so obvious. Patching the hull requires the requisite parts from a hull patch kit. Stopping the reactor meltdown involves routing coolant to it through a Pipe Dream interface. Solutions aren’t obscure ones made obvious by hand-holding text descriptions, nor is the game so abstract that you can’t make sense of the pieces before you (Uninvited). Though I appreciate that it’s not frustrating, it doesn’t strike a good balance, and it still doesn’t change the fact that the entire game can be beaten in an afternoon without outside assistance. Maybe it’s just me, but I’m looking for more out of a multi-CD adventure. That being said, it’s not a bad run for the brief time you’ll have together. There’s some genuine intrigue to be had, and some legitimate backstory to the conflict, with personal experiences that elevate the UN beyond “the bad guys” against your “good guys.” Operating the ship’s systems can be neat without getting too “techy,” and repairing a stubborn system so you can proceed does give a little sense of victory. It’s also worth noting that not every puzzle is a pushover, with a few that have less-obvious, but perfectly reasonable, solutions. You’ll also get to do some fun things, including an EVA to repair the outside of your ship, and operating a tactical battle minigame to defend the ship (a sequence which you can, of course, skip). But if you consider yourself a veteran adventure gamer, you won’t find anything too challenging here, and you won’t be engaged for very long. The ship and its various decks all look impressive, if a bit too clean. The corridors are predominately simple shapes and flat polygons, likely in an attempt to keep down the render load. You won’t find many unique textures or details either, all resulting in a ship that mostly looks like a cost-cutting set of a Sci-Fi Channel original movie. All of the specific ship areas, like the science lab and engineering room, do have an individual and recognizable look to them, despite the uniformity of hallways, crew quarters, and nearly everything else. 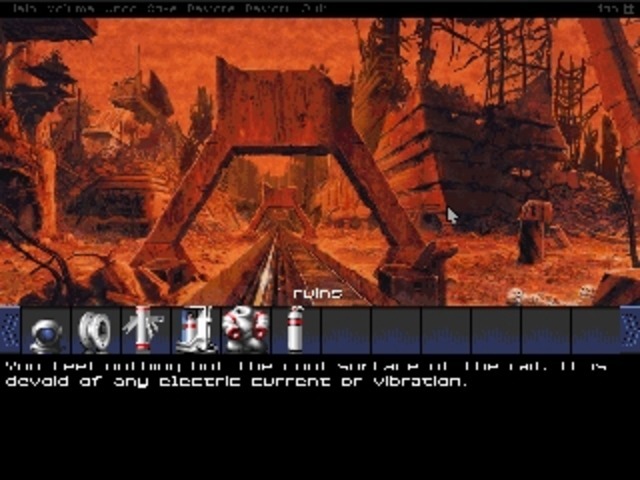 Later in the game you will encounter hand-painted backgrounds and scenes in the form of dream and vision sequences; all beautifully drawn, all far more detailed than could have been pulled off with a 1995 computer render. The CG sections certainly work, and have very slick FMV transitions between screens, and the hand artwork does a much better job of conveying the feel those individual sections were going for. Probably a very wise choice to use both. Mission Critical was billed as an interactive adventure game with Michael Dorn, but he – and really anyone else – are relegated to rare cutscenes. He even dies before the game proper starts. Yet for the brief periods he’s on the screen, he does a fine job in his role as the captain – though it seems to prove that all you have to do to make a convincing starship commander is to bark out technical jargon with authority. He’s assisted by Patricia Charbonneau, playing his second-in-command. You’ll see her more often, mostly because she’s the one recording your video briefings, and she does a fine job of playing an “on the edge but keeping it together” naval officer. The rest of the cast will be heard through voice recordings, and one astoundingly long cutscene in the middle, that will send you back to first disc just to watch it. The interface really is as simple as advertised. Your left click will always interact, and your right click with always cancel out of your current action. Occasionally you will get more than one interacting option, selectable by a menu in the upper left corner. A single click engages this menu, and another click on an option selects it. There are no look, examine, talk icons; everything is context-sensitive to the item you’re clicking on. Also, the most apparent option is automatically selected as the default, so instead of clicking “door, open, door” you can double-click on the door to open it. Occasionally you will get jokes or attempts at witty responses when trying an action or investigating an item, but these are painfully unfunny. A good example is, upon selecting “take” for book that’s not… mission critical: “You quickly assess the book’s value versus its mass. Value – zero. Mass – 1124 grams. The book goes back on the shelf.” Ehh? Someone’s trying way too hard. I often judge adventure game plots by how “worth it” they are to make into a game. If they’re not very interesting to begin with, or don’t make use of the interactive format in a way that has you discovering things and moving the plot along, then they probably would make better books. Mission Critical does have a story worth telling, and does have a few very good surprises in store that unravel in an appropriately interactive way. Still, there’s a lot of FMV for the sake of having FMV, or to have a talking head explain large portions of the necessary backstory. I question why a game this short needs three CDs, and if they worked parts of that exposition into the game itself, it wouldn’t. It’s a competent effort, and one you will have fun with, but it could certainly have been improved. An interesting story which, aside from the lengthy backstory told through FMV, is unraveled well interactively. It helps that the story is engaging, because the challenge certainly isn’t. A decade after your review, we can add FTL. If you expand “adventure” to include procedurally-generated challenges, like Rogue.